Thanks to luminous sentences like these, hope emanates from nearly every page of And There Was Light. New World Library is thrilled to be republishing this spiritual classic and we hope you’ll enjoy the following excerpt from the book. When you said to me: “Tell me the story of your life,” I was not eager to begin. But when you added, “What I care most about is learning your reasons for loving life,” then I became eager, for that was a real subject. All the more since I have maintained this love of life through everything: through infirmity, the terrors of war, and even in Nazi prisons. Never did it fail me, not in misfortune nor in good times, which may seem much easier but is not. Now, it is no longer a child who is going to tell this story and that is regrettable. It is a man. Worse yet, it is the university professor I have become. I will have to guard myself very carefully from trying to expound and demonstrate — those two illusions. I will have to return to the simplicity of a child and in addition reach back to France, leaving in thought this America where I live reassured and protected, to find again the Paris which held for me so many frightening experiences and so many happy ones. As I remember it, my story always starts out like a fairy tale, not an unusual one, but still a fairy tale. Once upon a time in Paris, between two world wars, there lived a happy little boy. I was that little boy, and today when I look back at him from the midpoint of life which I have reached, I marvel, a happy childhood is so rare. Besides, it is so little the fashion these days that one can hardly believe in it. All the same, if the water of my childhood runs clear, I am not about to muddy it up. That would be the worst kind of foolishness. I was born in 1924, on September 19 at noon, in the heart of Paris in Montmartre, between the Place Blanche and the Moulin Rouge. I was born in a modest nineteenth-century house, in a room looking out over a courtyard. My parents were ideal. My father, a graduate of a school for advanced physics and chemistry and a chemical engineer by profession, was both intelligent and kind. My mother, who had studied physics and biology herself, was completely devoted and understanding. Both of them were generous and attentive. But why say these things? As a small boy I was not aware of them. The small boy attributed no special qualities to his parents. He did not even think about them. There was no need, for his parents loved him and he loved them. It was a gift from heaven. My parents were protection, confidence, warmth. When I think of my childhood I still feel the sense of warmth above me, behind and around me, that marvelous sense of living not yet on one’s own, but leaning body and soul on others who accept the charge. My parents carried me along and that, I am sure, is the reason why through all my childhood I never touched ground. I could go away and come back. Objects had no weight and I never became entangled in the web of things. I passed between dangers and fears as light passes through a mirror. That was the joy of my childhood, the magic armor which, once put on, protects for a lifetime. My family belonged to “the petite bourgeoisie” in France in those days. We lived in small apartments but they always seemed to me large. The one I know best was on the Left Bank of the Seine, near the great garden of the Champ de Mars, between the Eiffel Tower, with its four paws spread apart, and the Ecole Militaire, a building which was only a name to me and whose shape I have quite forgotten. My parents were heaven. I didn’t say this to myself so precisely, and they never said it to me, but it was obvious. I knew very early, I am quite sure of it, that through them another Being concerned himself with me and even addressed himself to me. This Other I did not even call God. My parents spoke to me about God, but only later. I had no name for him. He was just there and it was better so. Behind my parents there was someone, and my father and mother were simply the people responsible for passing along the gift. My religion began like this, which I think explains why I have never known doubt. This confession may be something of a surprise, but I set store by it because it will make so many other things clear, my recklessness, for instance. I was always running; the whole of my childhood was spent running. Only I was not running to catch hold of something. That is a notion for grownups and not the notion of a child. I was running to meet everything that was visible, and everything that I could not yet see. I traveled from assurance to assurance, as though I were running a race in relays. Call it the birth of personality if you like, but be sure that it was not accompanied by any feeling of panic. It was simply that the beam of universal happiness had fallen upon me like a bolt from the blue. I had my share of misery and grief as all children do. But truthfully I don’t remember them. They vanished from my memory just like the presence of physical pain. As soon as it leaves the body, it leaves the spirit. The violent, the ridiculous, the shady and the uncertain, all these I knew later on. But I cannot place any of them in the earliest years of my life. And that is what I meant just now when I spoke of the clear water of my childhood. For seven years I jumped, I ran, I covered the paths of the Champ de Mars. I scoured the sidewalks of the narrow Paris streets where the houses were crowded into the fragrant thoroughfares. For in France each house has its characteristic smell. Grownups hardly notice this, but children know it well, and can recognize the buildings by their odors. There is the smell of the creamery, the smell of the pastry shop, the confectioner’s, the shoemaker’s, the druggist’s, and the smell of the shop belonging to the man who has such a beautiful name in France, “the merchant of colors.” These buildings I knew by sniffing the air like a small dog. I felt sure that nothing was unfriendly, that the branches I used to swing on would hold firm, and that the paths, no matter how winding, would take me to a place where I would not be afraid; that all paths, eventually, would lead me back to my family. You might say that I had no story, except the most important of all, the story of life. Still, there was light, and light cast a spell over me. I saw it everywhere I went and watched it by the hour. None of the rooms in our three-room apartment has remained clear in my memory. But the balcony was different, because on the balcony there was light. Impetuous as I was, I used to lean patiently on the railing and watch the light flowing over the surface of the houses in front of me and through the tunnel of the street to right and left. This light was not like the flow of water, but something more fleeting and numberless, for its source was everywhere. I liked seeing that the light came from nowhere in particular, but was an element just like air. We never ask ourselves where air comes from, for it is there and we are alive. With the sun it is the same thing. There was no use my seeing the sun high up in the sky in its place in space at noon, since I was always searching for it elsewhere. I looked for it in the flickering of its beams, in the echo which, as a rule, we attribute only to sound, but which belongs to light in the same measure. Radiance multiplied, reflected itself from one window to the next, from a fragment of wall to cloud above. It entered into me, became part of me. I was eating sun. This fascination did not stop when night fell. When I came in from outdoors in the evening, when supper was over, I found the fascination again in the dark. Darkness, for me, was still light, but in a new form and a new rhythm. It was light at a slower pace. In other words, nothing in the world, not even what I saw inside myself with closed eyelids, was outside this great miracle of light. Whenever I ran across the Champ de Mars I was still chasing light. I was just about to jump into it, with my feet together, at the end of the path; to catch hold of it as you catch a butterfly over the pond; to lie down with it in the grass or on the sand. Nothing else in nature, not even the sounds to which I listened so attentively, was as precious to me as light. When I was about four or five years old, I suddenly discovered that you can hold light in your hands. To do this you only need to take colored crayons or blocks and play with them. I began to spend hours doing all kinds of coloring, without much form I am sure, but I kept diving in, as you plunge into a fountain. My eyes are still filled with those colors. They told me later that even at this early age I had poor sight. Myopia I think it was, a condition which positive people would think quite adequate to explain my obsession. But as a young child I was not aware that I did not see very well. I was not concerned about it, because I was happy to make friends with light as though it were the essence of the whole world. Colors, shapes, even objects, the heaviest of them, all had the same vibration. And today, every time I assume the attitude of tender attention, I find the same vibration once again. In those days, when people asked me what was my favorite color, I always answered “Green.” But I only learned later that green was the color of hope. I am certain that children always know more than they are able to tell, and that makes the big difference between them and adults, who, at best, know only a fraction of what they say. The reason is simply that children know everything with their whole beings, while we know it only with our heads. When a child is threatened by sickness or trouble, he knows it right away, stops his games and takes refuge with his mother. In just this way, when I was seven years old, I realized that fate had a blow in store for me. It happened in the Easter holidays in Juvardeil, a little village in the Anjou where my maternal grandparents lived. We were about to go back to Paris and the buggy was already at the door to take us to the station. In those days, to travel from Juvardeil to the railroad station at Etriché-Chateauneuf, seven kilometers away, we used a horse and buggy. The grocer’s truck was the first automobile I really knew in the village, and that was not until three or four years later. That day in the country, as the buggy was waiting and jingling its bells, I had stayed behind in the garden, by the corner of the barn, alone and in tears. These are not the kind of tears they tell you about later, for I still feel them deeply whenever I think of them. I was crying because I was looking at the garden for the last time. I had just learned the bad news. I couldn’t say how, but there was absolutely no doubt. Sunlight on the paths, the two great box trees, the grape arbor, the rows of tomatoes, cucumbers and beans, all the familiar sights which had peopled my eyes, I was seeing for the last time. And I was aware of it. This was much more than childish sorrow and when my mother, after looking for me, finally found me and asked what the trouble was, I could only say: “I am never going to see the garden again.” Three weeks later it came about. On the third of May, I was at school as usual, the elementary school in the part of Paris where my parents lived on Rue Cler. At ten o’clock I jumped up with my classmates who were running for the door to the playground outside. In the scuffle, an older boy who was in a hurry came up from the back of the room and ran into me accidentally from behind. I hadn’t seen him coming and taken off guard lost my balance and fell. As I fell, I struck one of the sharp corners of the teacher’s desk. I was wearing glasses because they had discovered I was nearsighted. The glasses were made of shatterproof glass, and it was just this precaution that was my undoing. The lenses did not break, but the blow was so violent that one arm of the spectacles went deep into the tissue of the right eye and tore it away. I lost consciousness but came to immediately after being carried to the school playground. The first thing that occurred to me, I remember vividly, was, “My eyes, where are my eyes?” I could hear frightened people around me talking in panic about my eyes. But even without the voices and the pain I should have known where I had been hit. They bandaged me up and took me home with fever raging through my body. There everything blacked out for more than twenty-four hours. I learned later that the distinguished specialist my family called at once had declared the right eye was lost and must be removed. As soon as they could they would do the necessary surgery. As for the left eye, there was little doubt that it too was gone since the blow had been so hard as to cause sympathetic ophthalmia. At any rate, the retina of the left eye had been badly torn. The next morning they operated and with success. I had become completely and permanently blind. Every day since then I have thanked heaven for making me blind while I was still a child not quite eight years old. I bless my lot for practical reasons first of all. The habits of a boy of eight are not yet formed, either in body or in mind. His body is infinitely supple, capable of making just the movement the situation calls for and no other; ready to settle with life as it is, ready to say yes to it. And the greatest physical miracles can follow from this acceptance. I am deeply moved when I think of all the people whom blindness strikes when they are fully grown, whether it is caused by accident or injury in war. Often they have a hard lot, certainly one harder than mine. At all events, I have other reasons, not material, for thanking fortune. Grown-up people forget that children never complain against circumstances, unless of course grownups are so foolish as to suggest it to them. For an eight-year-old, what “is” is always best. He knows nothing of bitterness or anger. He may have a sense of injustice, but only if injustice comes from people. For him events are always signs from God. These simple things I know, and I know that since the day I went blind I have never been unhappy. As for courage, which adults make so much of, children do not see it as we do. For a child courage is the most natural thing in the world, the thing to do, through life, at each moment. A child does not think about the future, and so is protected from a thousand follies and nearly every fear. He relies on the course of events, and that reliance brings him happiness with every step. From now on I shall find obstacles in my way, very serious ones, as I tell my story: first, obstacles of language, because in what I have to say about blindness, little known and almost always surprising, I shall run the risk of sounding either trite or extravagant; then, obstacles of memory. I went blind at the age of eight, and am still blind, and what I experienced then I still experience every day. Without wanting to, I am bound to confuse dates and even periods. But such barriers are more literary than real. Facts are facts, and I only need to rely on their eloquence. Jacques Lusseyran (September 19, 1924–July 27, 1971) was a blind French author and French Resistance leader. Born in Paris, he became totally blind in a school accident at the age of eight. He soon adapted to being blind and maintained many close friendships. At a young age he became alarmed at the rise of Adolf Hitler in Germany and decided to learn German so that he could listen to radio broadcasts and follow the advancement of the Nazis. Less than a year after the German invasion of France, in the spring of 1941, at the age of seventeen, Lusseyran formed a resistance group called the Volunteers of Liberty with fifty-two other boys. Because of his ability to read people as a blind person, he was put in charge of recruitment, and the group grew to over six hundred young men. The group later merged with another Resistance group called Défense de la France, which published an underground newspaper that eventually achieved a circulation of 250,000. After the war, it became one of France’s most respected newspapers, France Soir. In July 1943, Lusseyran was arrested, along with twenty-five other leaders of Défense de la France, and spent nearly fifteen months in the Nazis’ Buchenwald concentration camp. When the U.S. Third Army arrived at Buchenwald in April 1945, Lusseyran was one of roughly thirty survivors of a transport of two thousand French citizens. After the war, Lusseyran became a university professor in the United States. He died in a car accident in France in 1971. 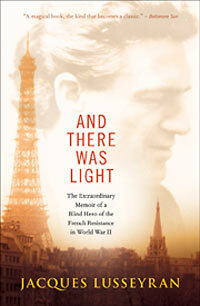 From the book And There Was Light: The Extraordinary Memoir of a Blind Hero of the French Resistance in World War II by Jacques Lusseyran. Copyright © 1963 by Jacques Lusseyran.